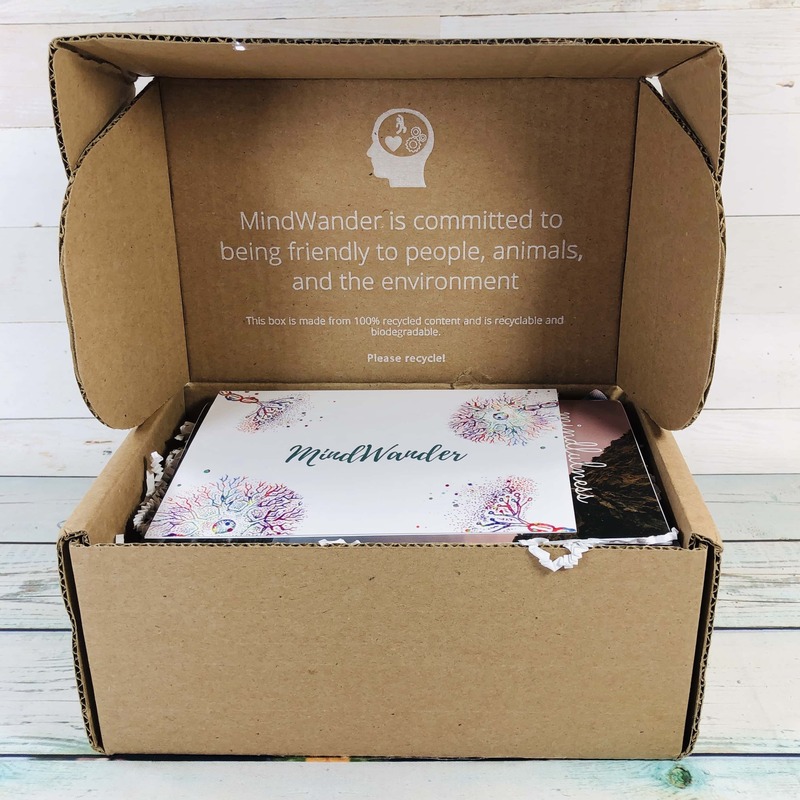 MindWander is a monthly subscription box that aims to help you reduce stress and anxiety through self-care and by using cognitive behavioral therapy. Boxes will include a mini-workbook plus an assortment of 4-5 full-sized items including bath & body, lifestyle, and novelty items. 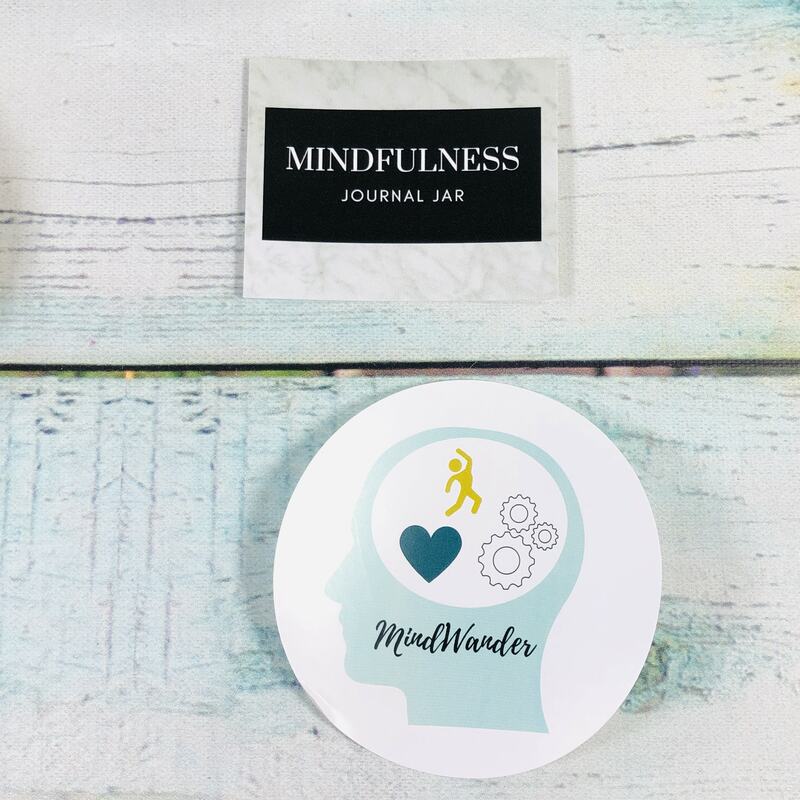 MindWander is $37.99 a month, or get the Mini for $17.99, which includes the workbook and 1-3 items. 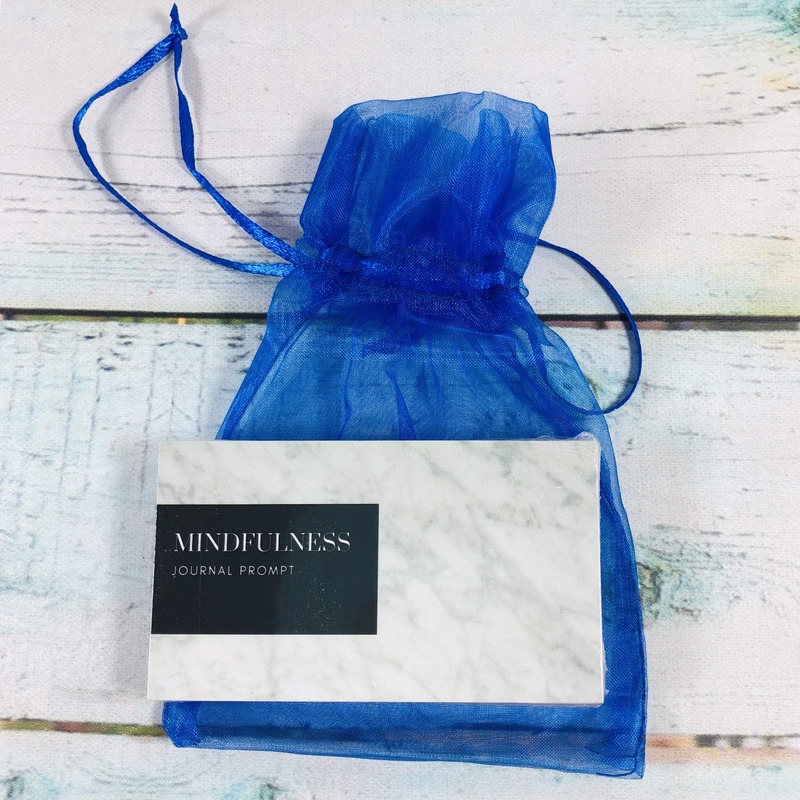 If you’re looking to put a little more therapy in your self-care routine, this is the box for you! 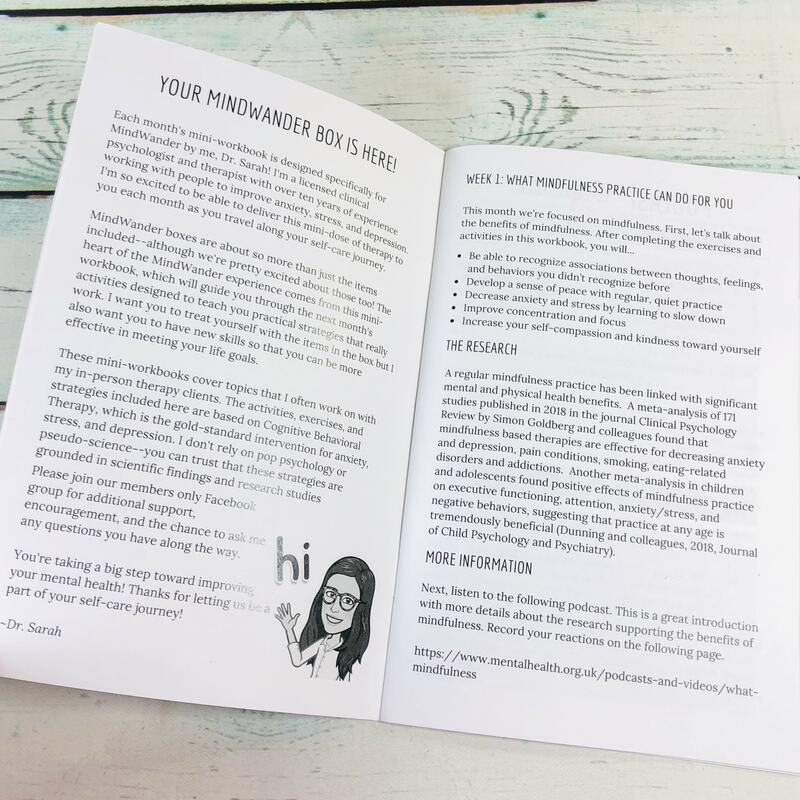 Developed by a PhD psychologist, boxes include a mini-workbook filled with strategies for decreasing anxiety and stress and increasing confidence and positivity. 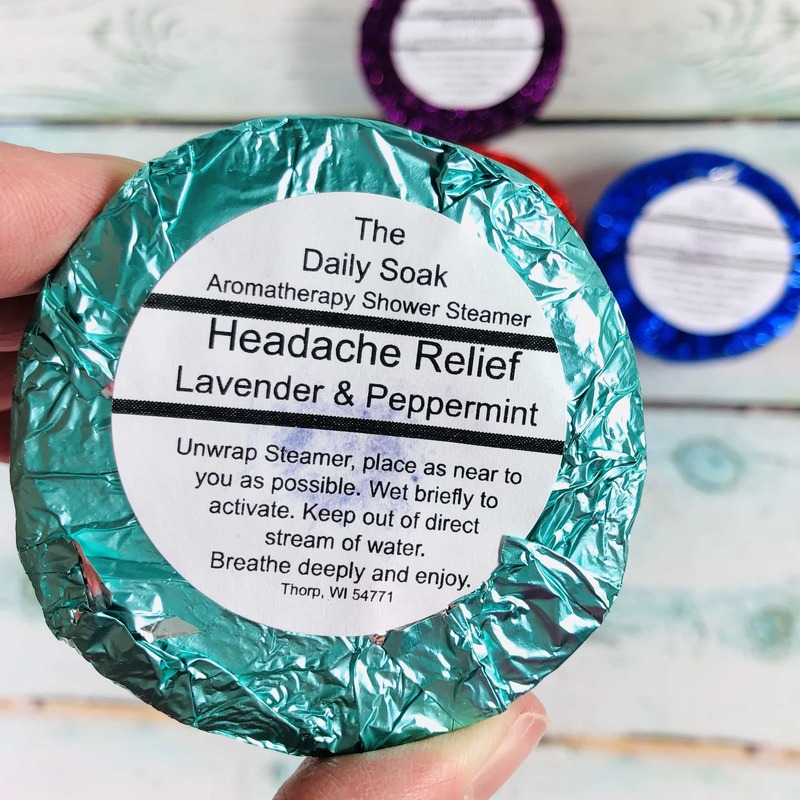 After all that hard work, treat yourself with a variety of high quality self-care items! My items were tucked into shredded paper squiggles and I noticed that the lid says the box is made of recycled content. Everything in my box! 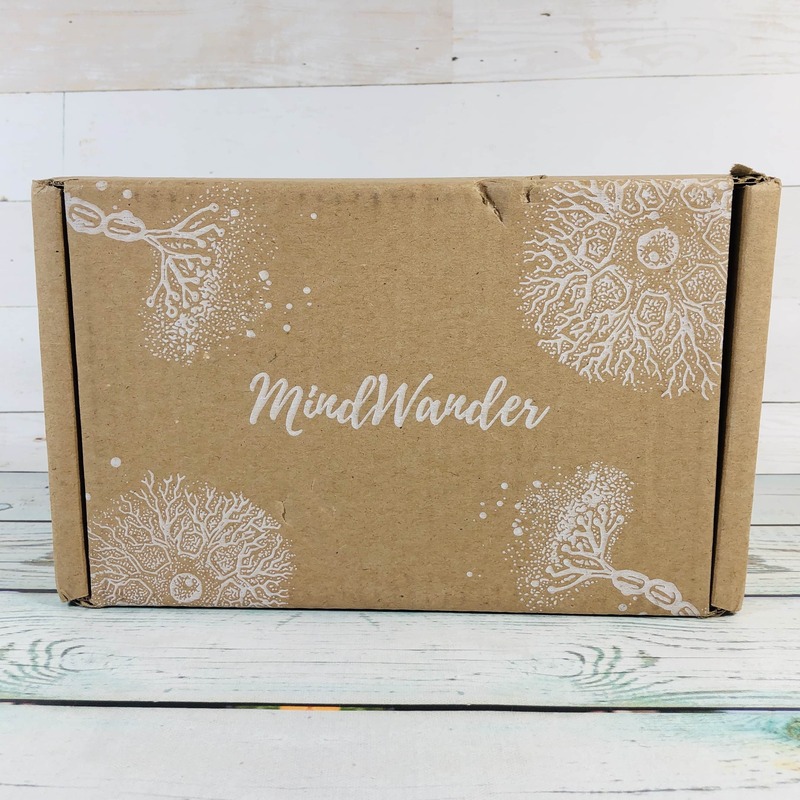 This is my very first MindWander box so let’s see what’s in here! I love the colors of this product info card! Is this a neuron? Who knew it could look so pretty! The card had info and suggested retail prices for each item, along with a description. Very informative! 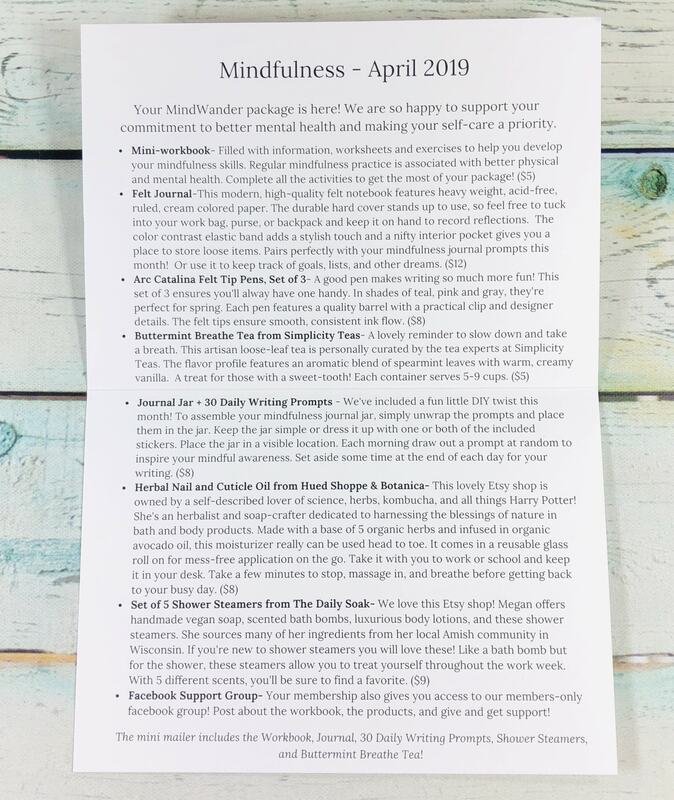 The theme for April is Mindfulness. The bottom of the card lists which items come in the Mini MindWander. The Mini Work-Book ($5) looks really professional. 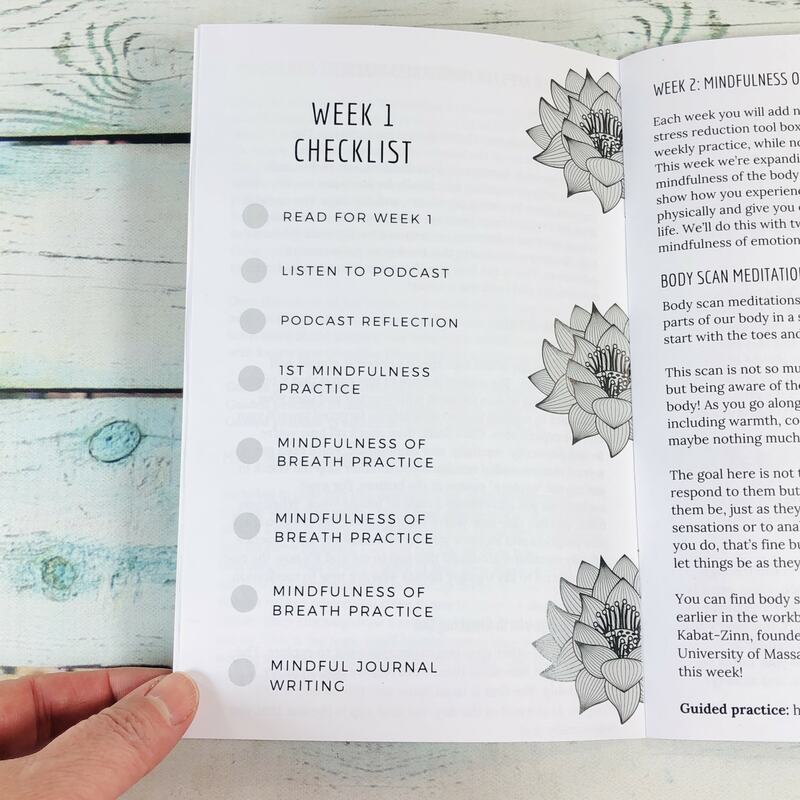 I’m going to show you each page through the first week, but there are activities for 4 weeks. 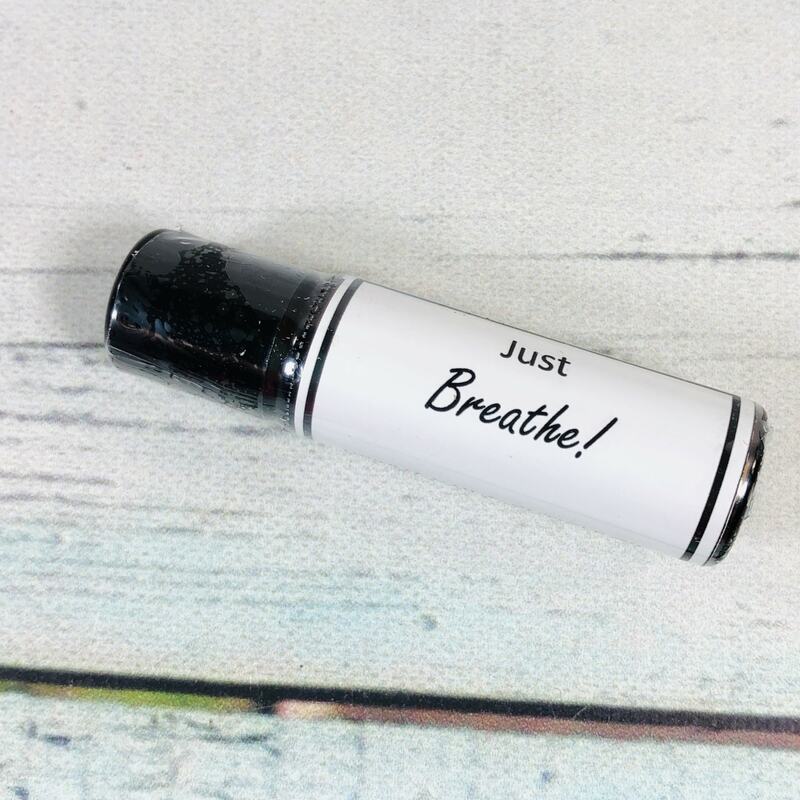 Next it shows us how to practice mindfulness. Some apps were suggested for those who prefer a bit more tech. 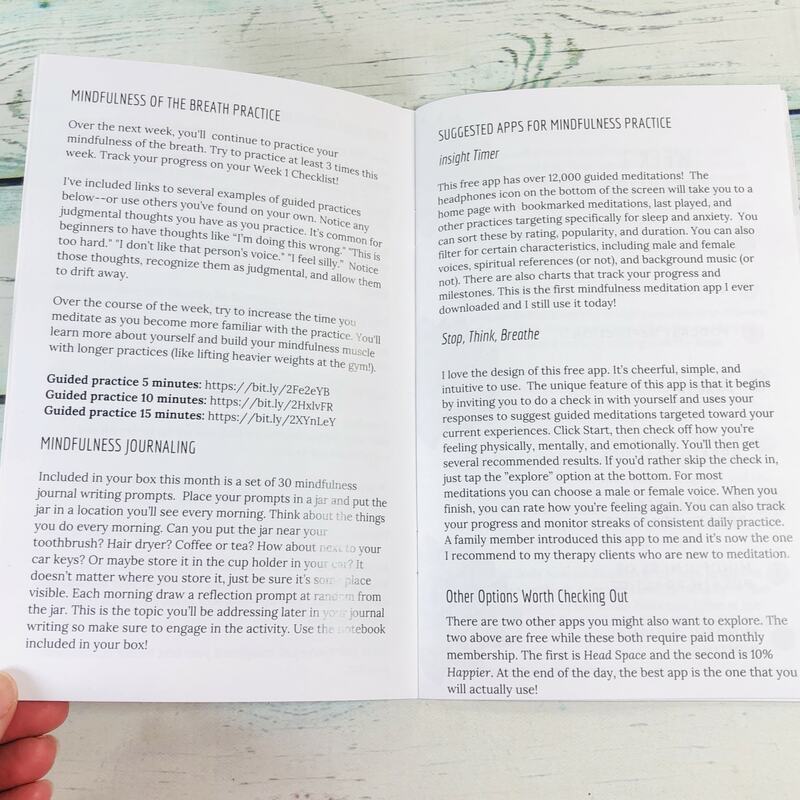 There was a checklist to make sure you stay on track. 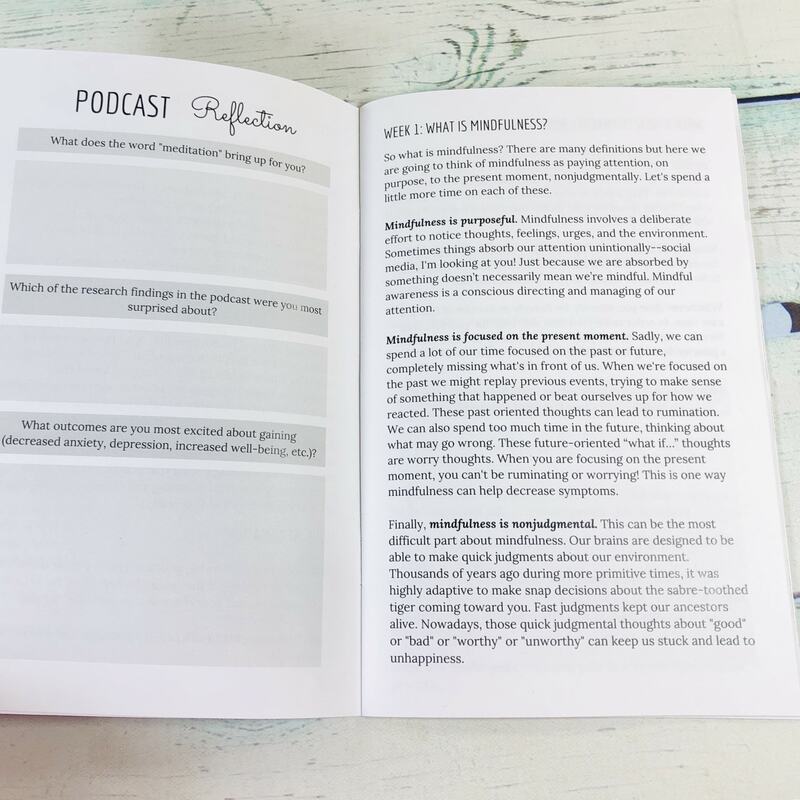 The back of the book had pages to write your reflections after following the booklet all month. 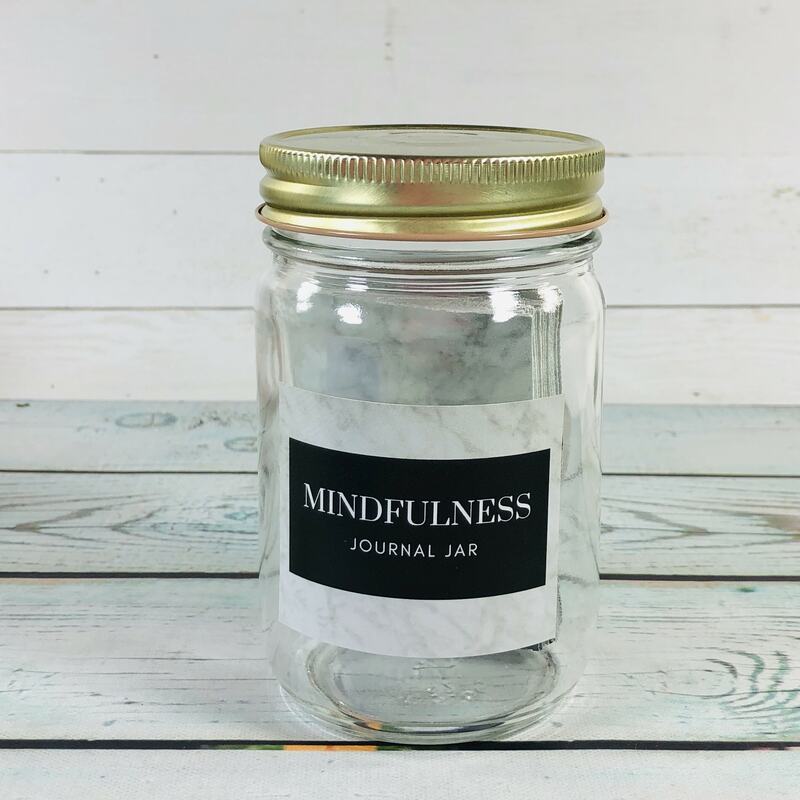 Journal Jar + 30 Daily Writing Prompts ($8) The first item is a DIY, but don’t worry, it’s easy to assemble! There was a set of journal prompts. 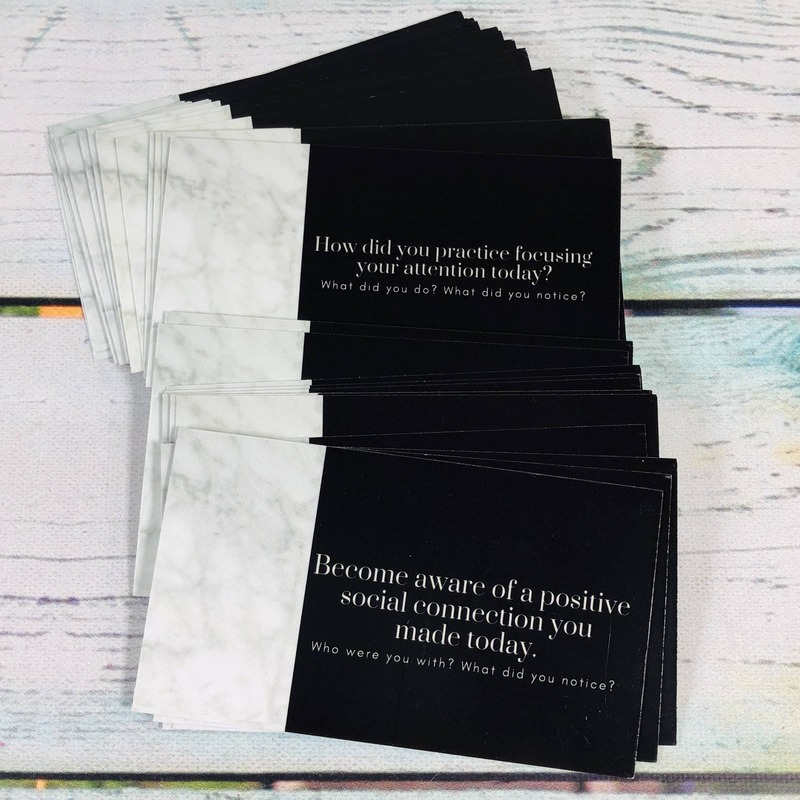 There are 30 cards and you can reuse them month after month. It also came with a glass jar. 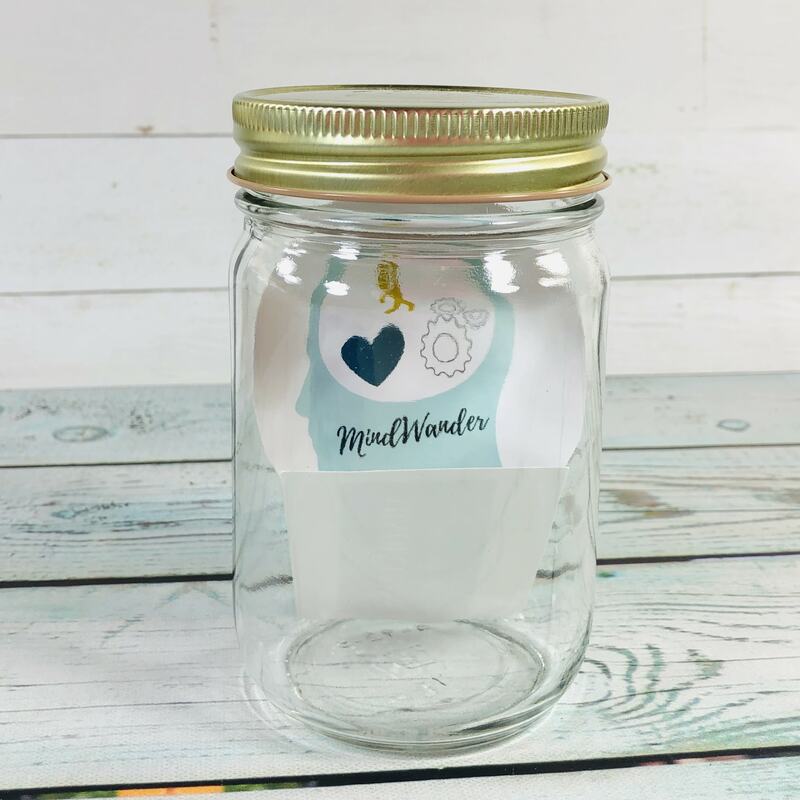 I placed both stickers on the jar and then placed the cards inside. 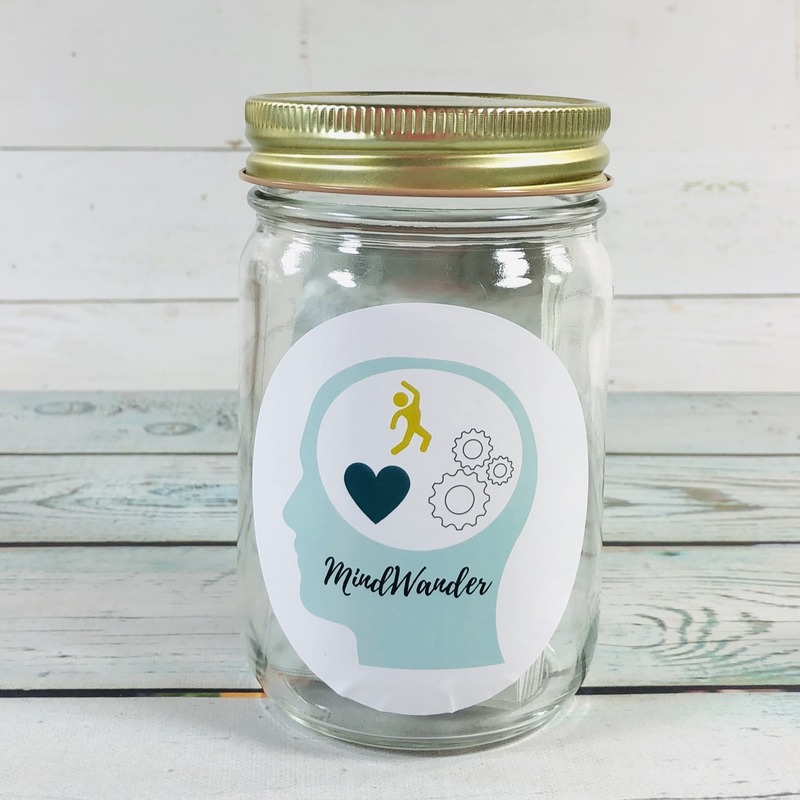 The next item goes along with the jar. 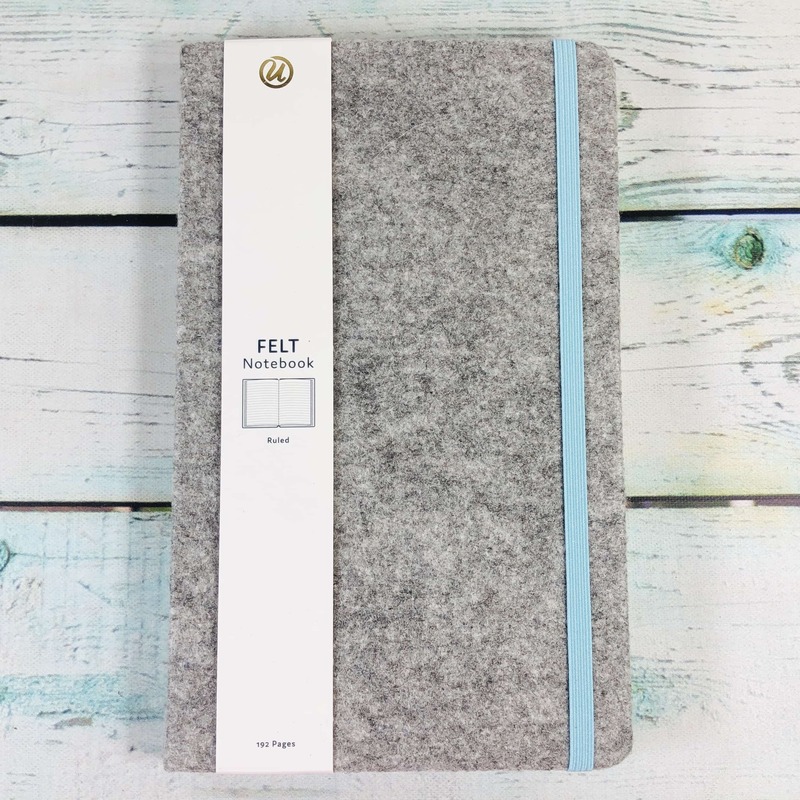 UBrands Felt Notebook ($12) I have never received a felt-covered journal before! The blue of the elastic band looks so pretty against the grey cover! 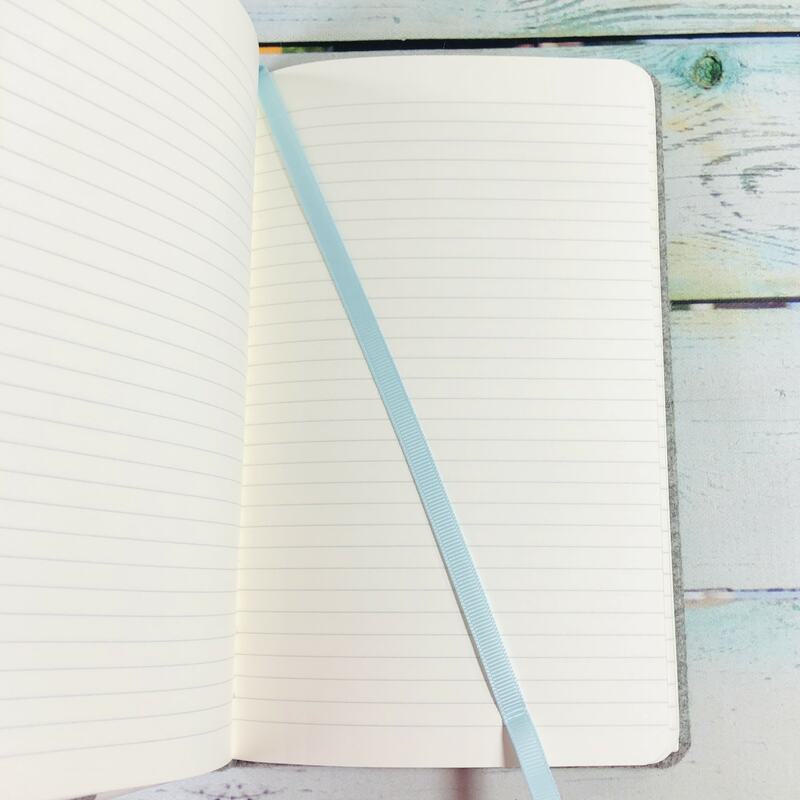 The notebook has 192 pages and is lined. The dimensions are 5″ x 8.25″. There’s even a pocket in the back cover! 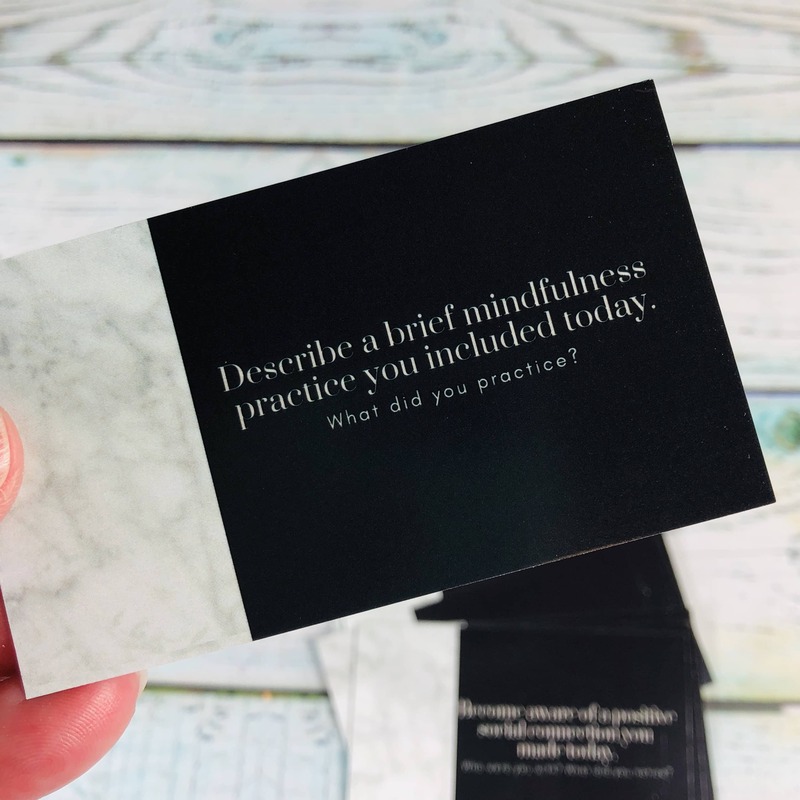 You can use this notebook to journal your answers to the mindfulness cards. 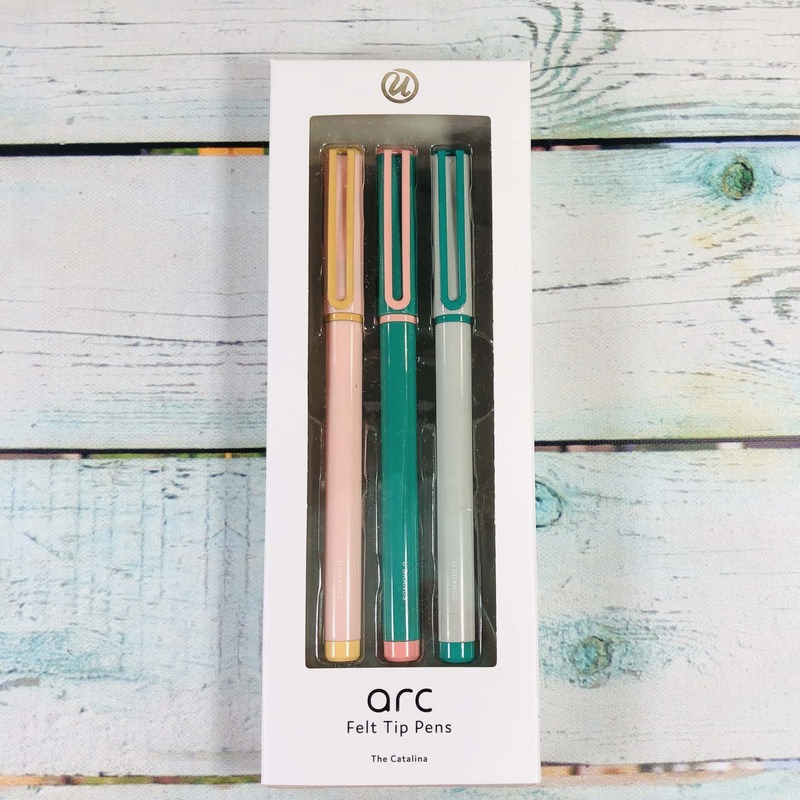 Arc Catalina Felt Tip Pens ($8) What else do you need to fill in your journal? 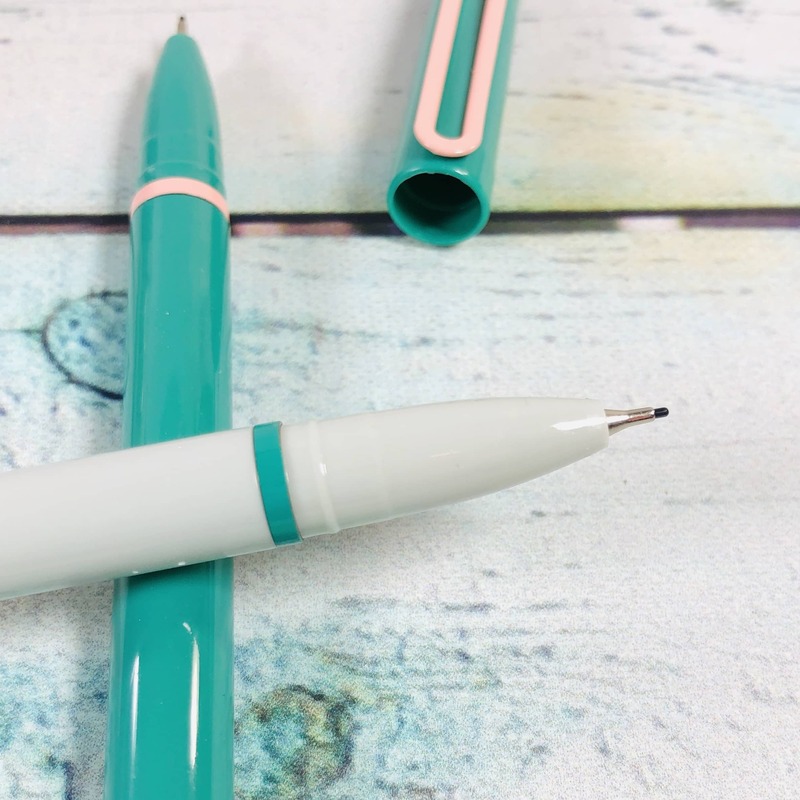 How about these lovely felt-tipped pens! 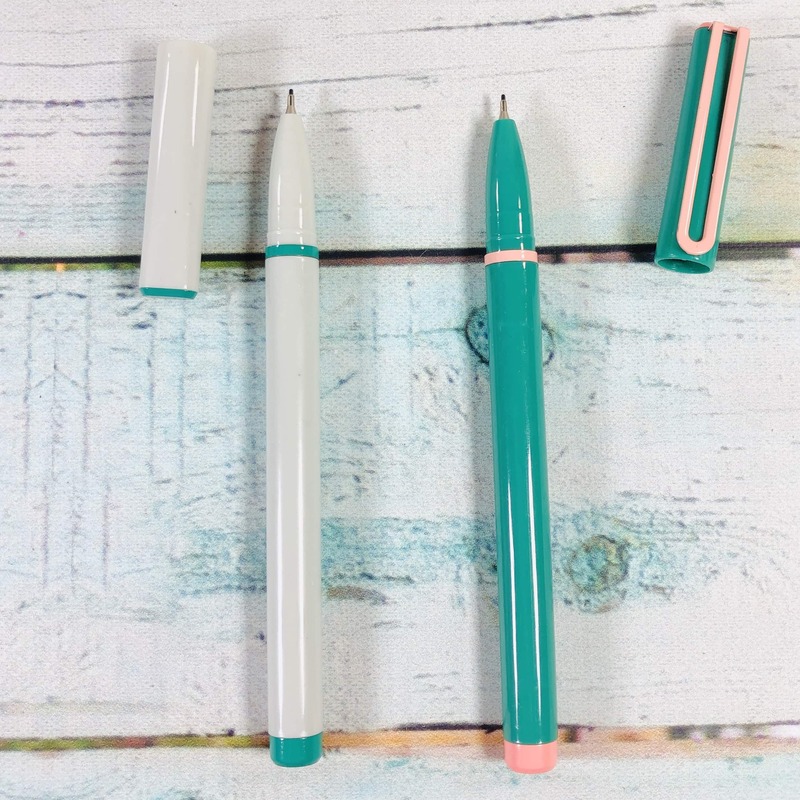 Three pens were included so you can stash them around the house or office. Oops! 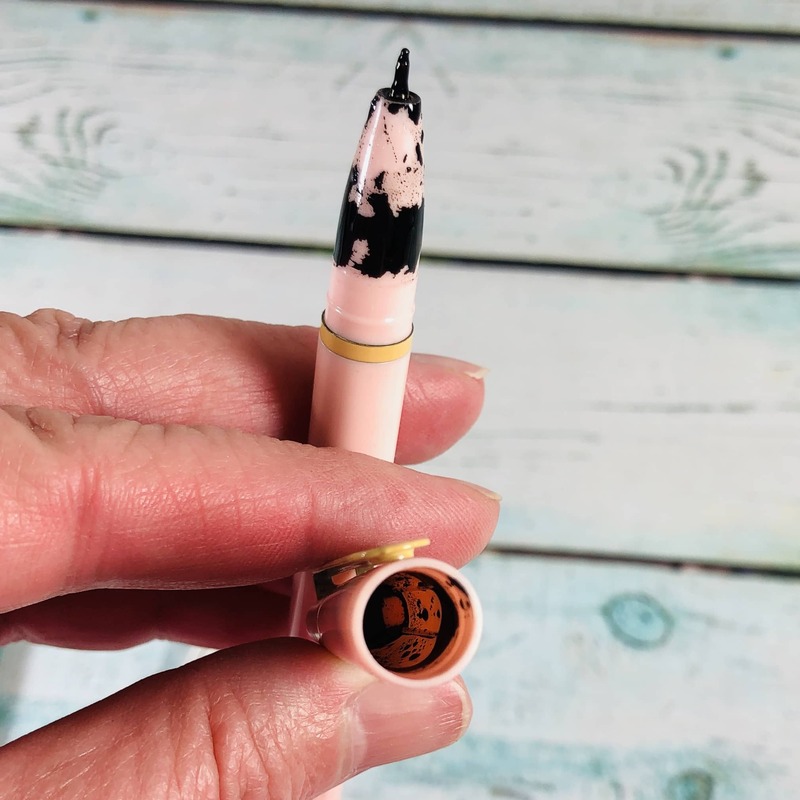 One of my pens didn’t last the trip, maybe it’s been like that for a while but you never know until you open it up, it happens. I still have two perfectly pointed pens. 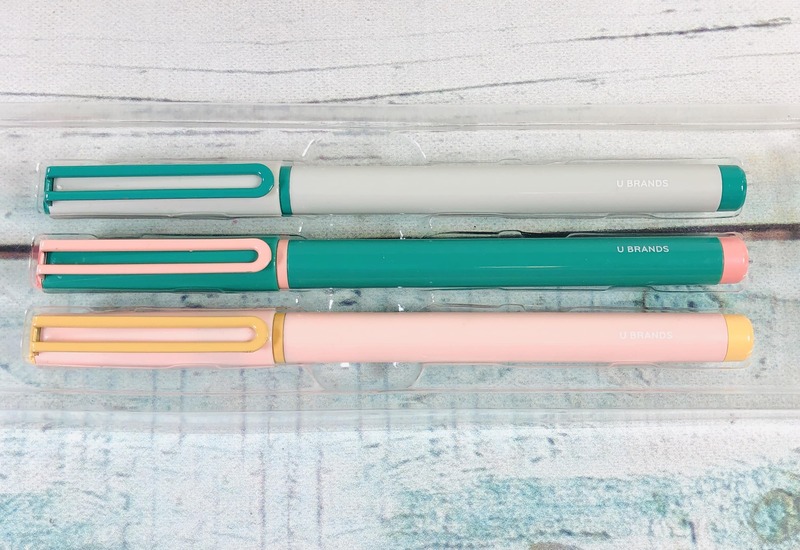 They feature a fine-tip and I think they are neat, I don’t have any pens like this! 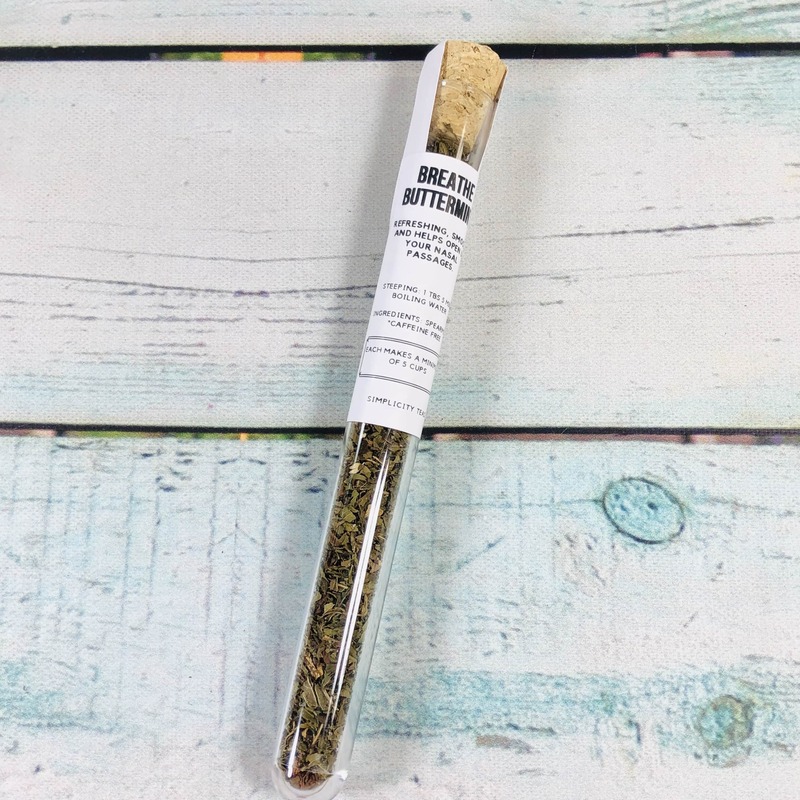 Simplicity Teas Buttermint Breathe Tea ($5) Simplicity Teas has their own subscription box and it looks like the teas are usually exclusive to their box, so I couldn’t find this for sale. It looks like spearmint is the only ingredient according to the label. It said to use 1 TBS, which is 1 tablespoon, but I used 1.5 teaspoons instead and it was plenty strong. I enjoyed sipping this caffeine-free tea before bed, while relaxing at the end of the day. Just sip and say “ahhhh”. 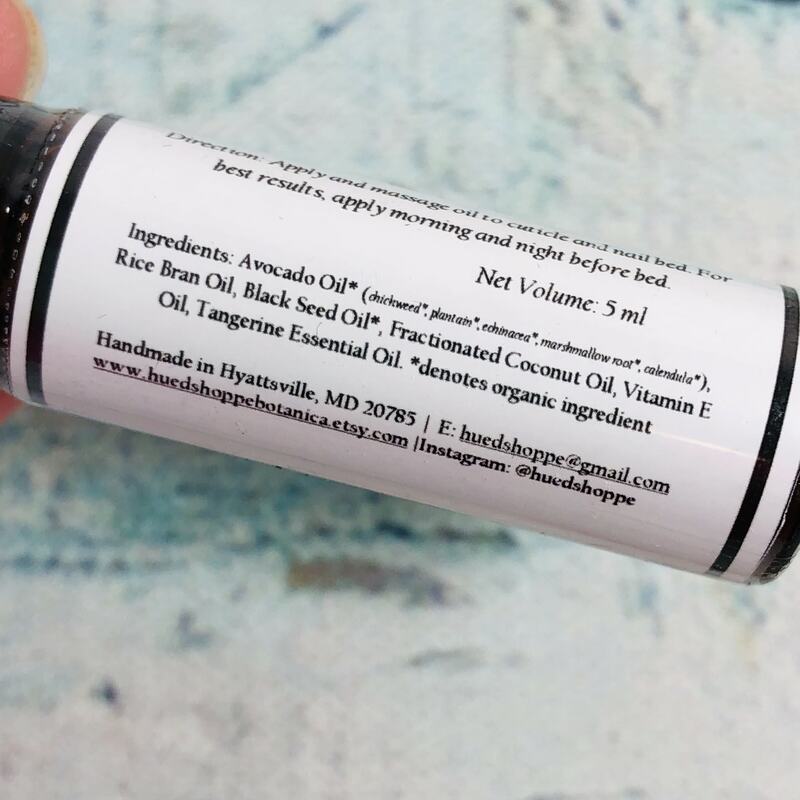 Hued Shoppe & Botanica Herbal Nail & Cuticle Oil ($8.99) Here is another item that encourages you to take a deep breath, it’s even says so on the label! 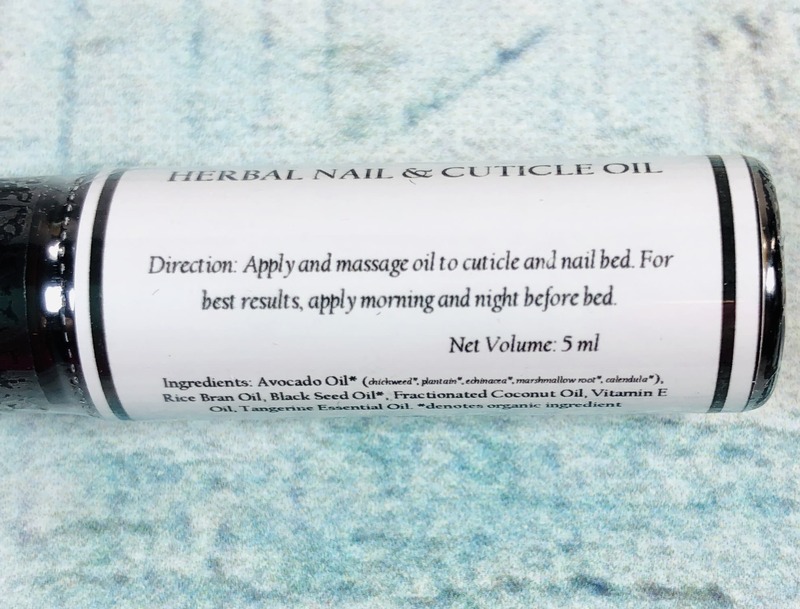 Just roll-on cuticles or really anywhere you have a dry spot of skin, it’s multipurpose. 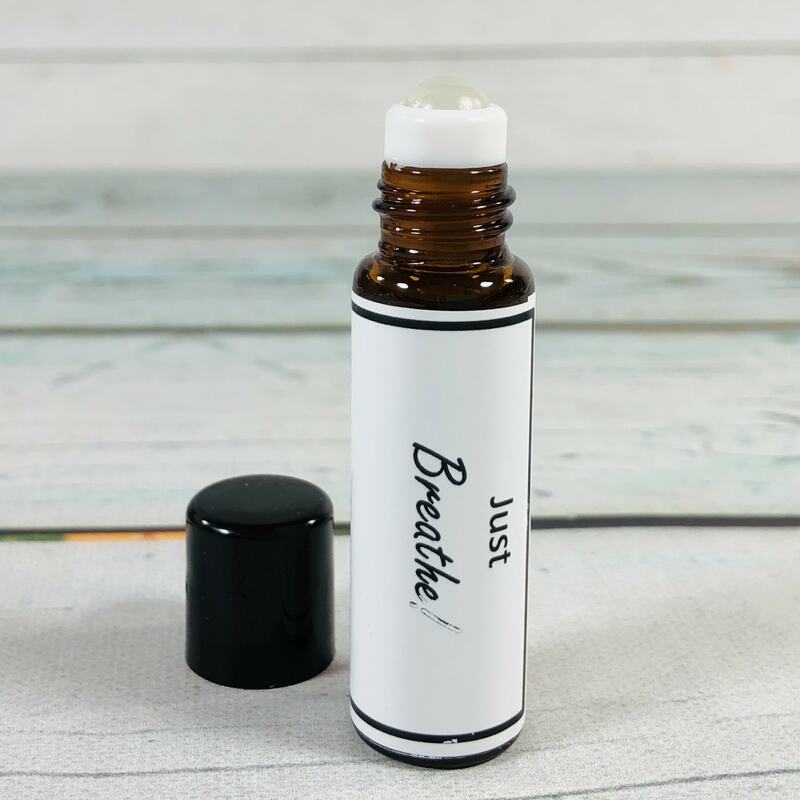 Plant oils and essential oil for scent are the all-natural ingredients in the oil. It looks like the avocado oil has been infused by other plants such as calendula. Its small size makes it handy for travel or for keeping bedside for ease of use. I think it smells mainly of “black seed”, which I believe is a blend of different herb or spice seeds. It smells herbal. 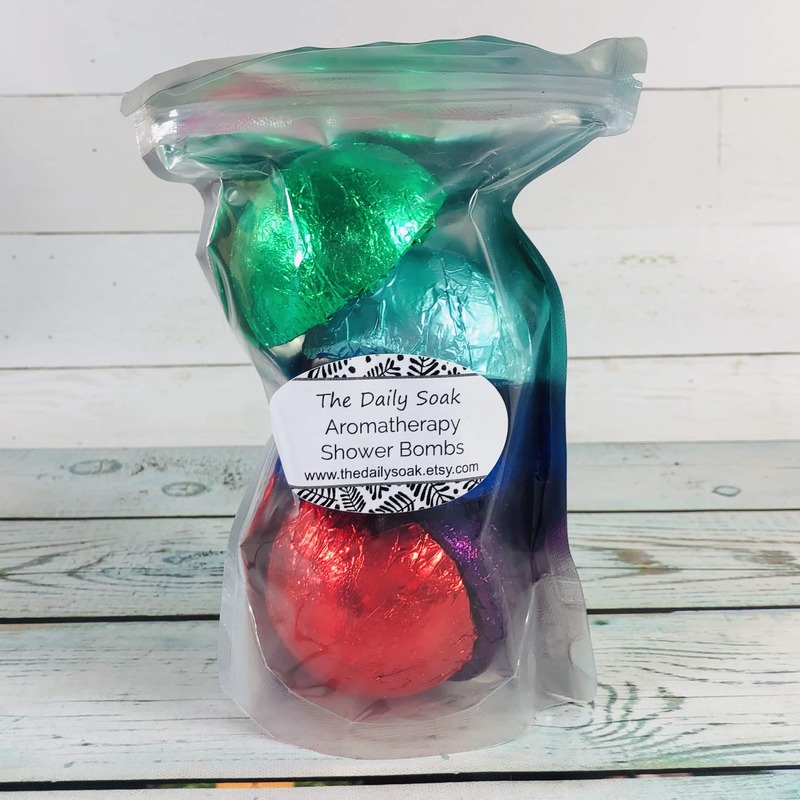 The Daily Soak Aromatherapy Shower Bombs ($9) At first glance I thought this was holiday lights! Turns out it is a set of 5 shower steamers! 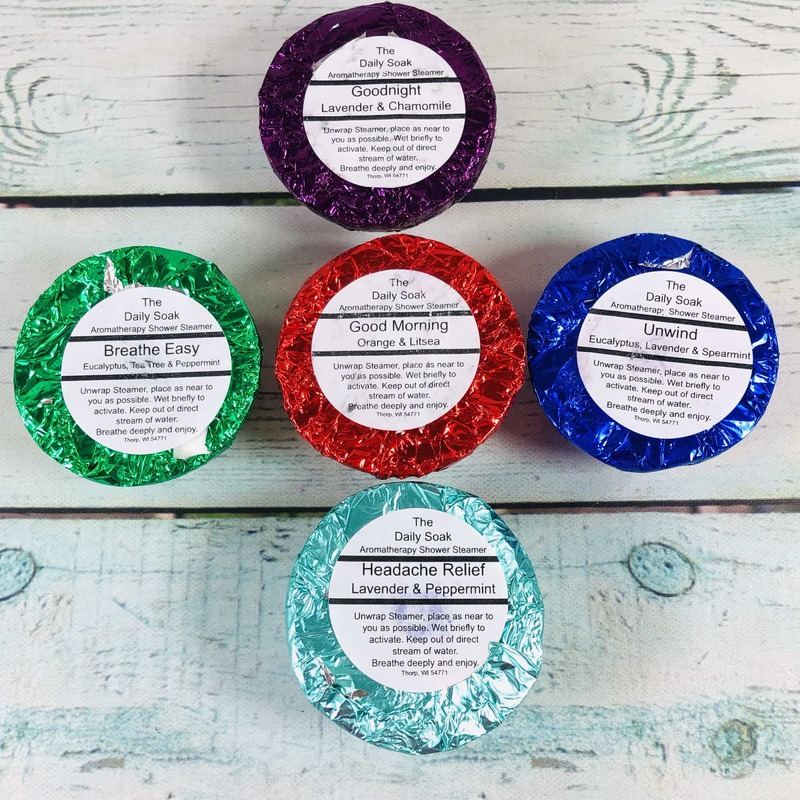 I prefer shower steamers to bath bombs because I pretty much only take showers. Five different scents were in this assortment. 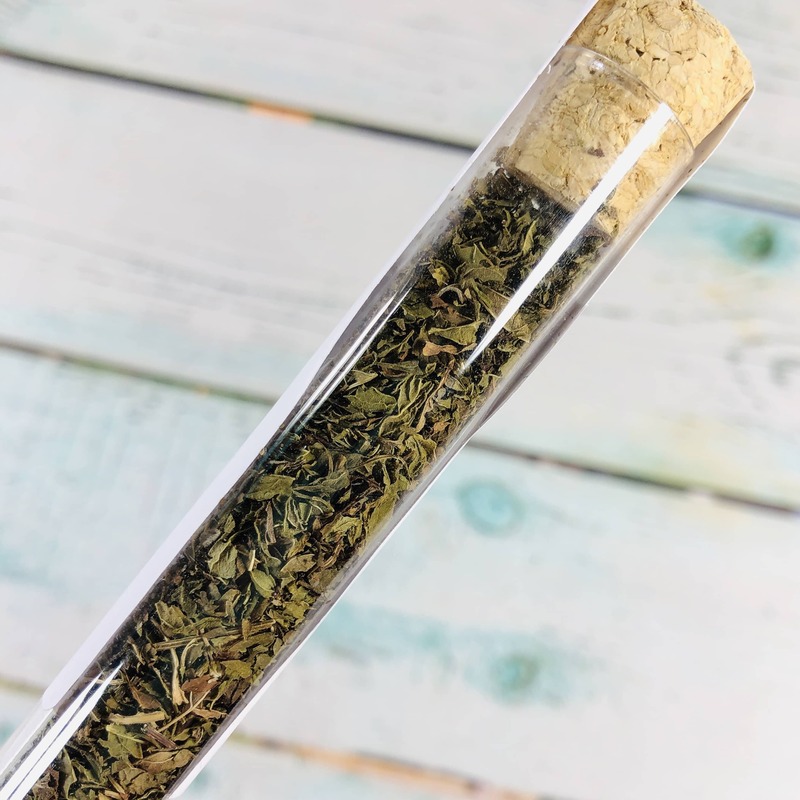 I couldn’t find a list of ingredients on the website or the packaging. 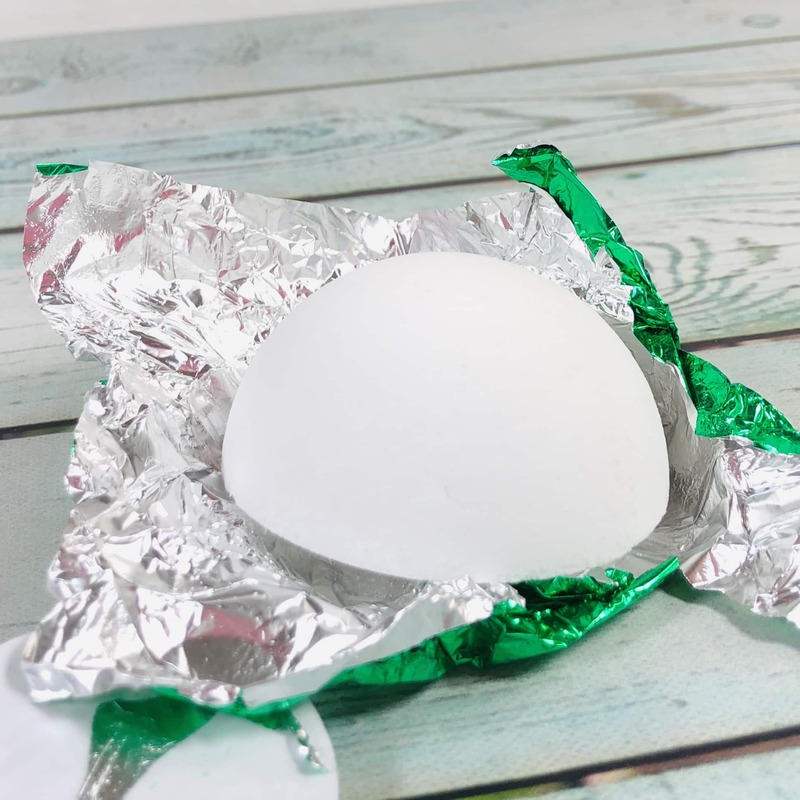 I’m guessing baking soda, citric acid, and essential oils are probably the bulk of the ingredients. 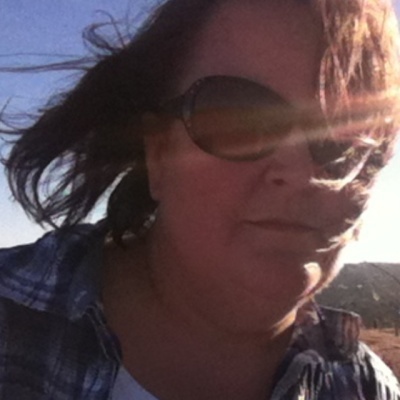 They are pretty big too. The one I used in my shower still had some left the next morning. 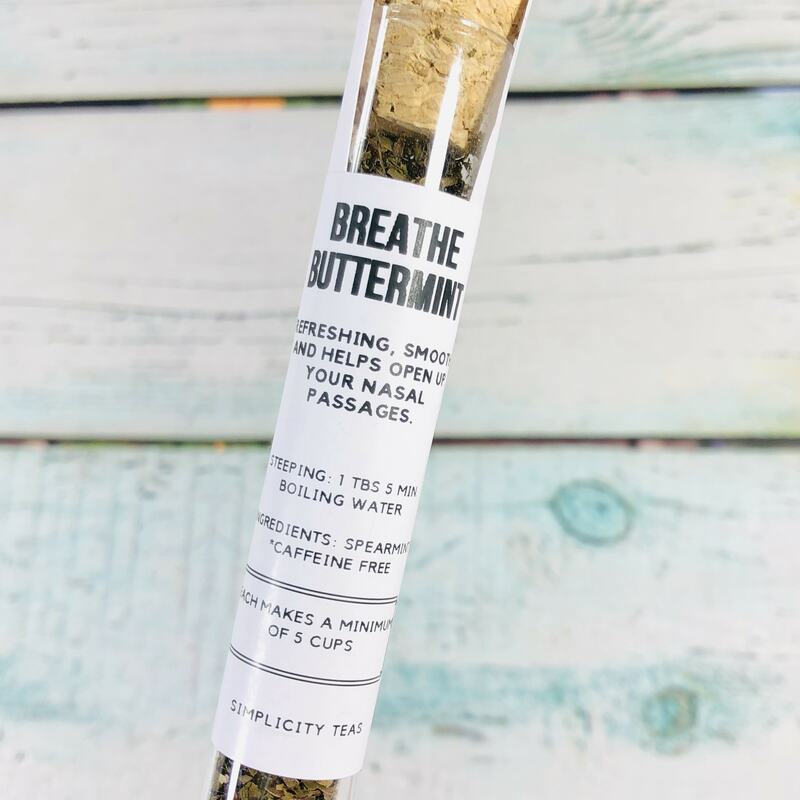 I thought it smelled really good and invigorating, plus it did encourage me to take deep breaths while I took my morning shower. 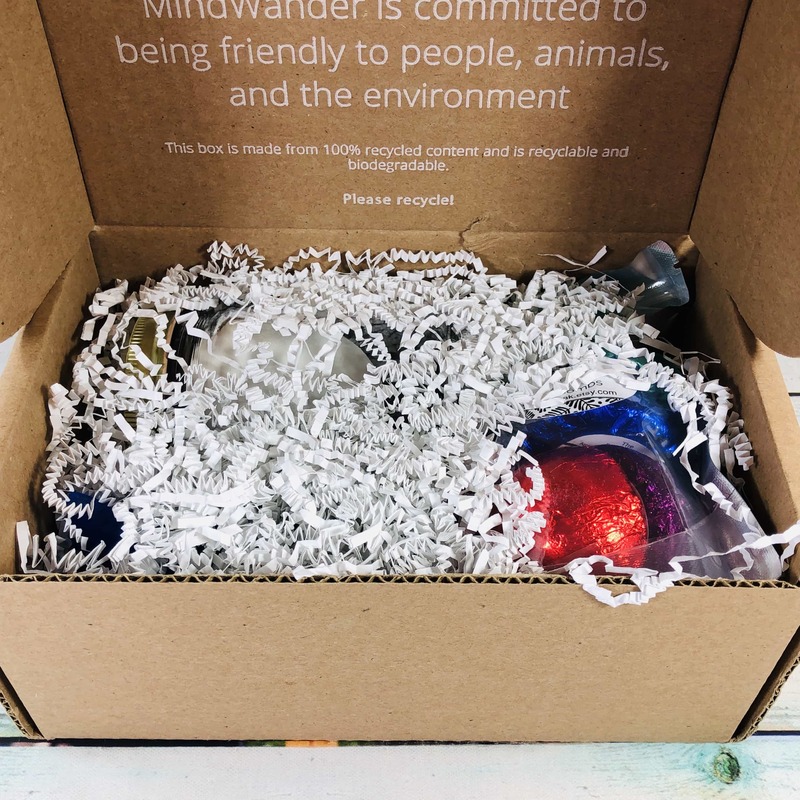 I was very pleased with my first MindWander box! I thought the theme and the items that went along with it were of very nice quality with appropriate curation, it wasn’t a random assortment of “stuff”. 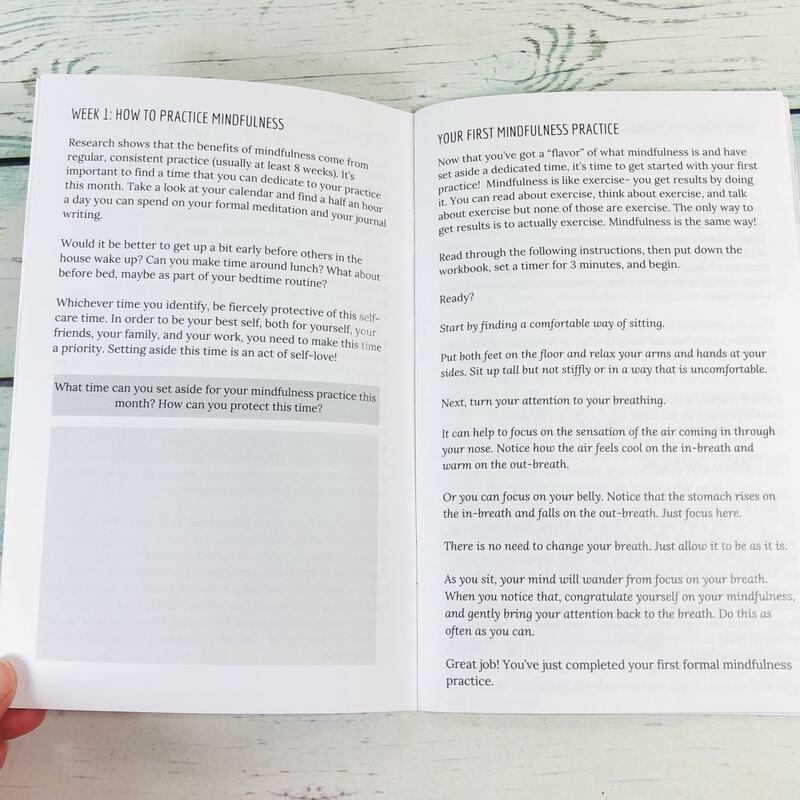 I enjoyed using the products and look forward to working through the mini-workbook and journal prompts. The value for this box was around $59.49 and I really feel like the box as a whole was well thought out and I look forward to future boxes! 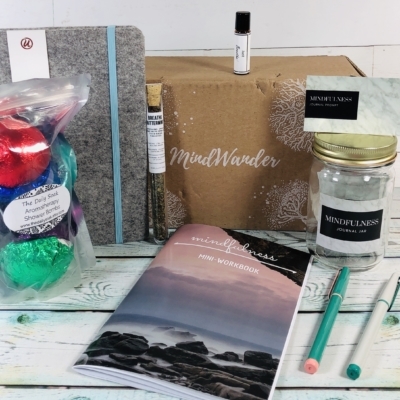 What do you think of this month’s MindWander box? 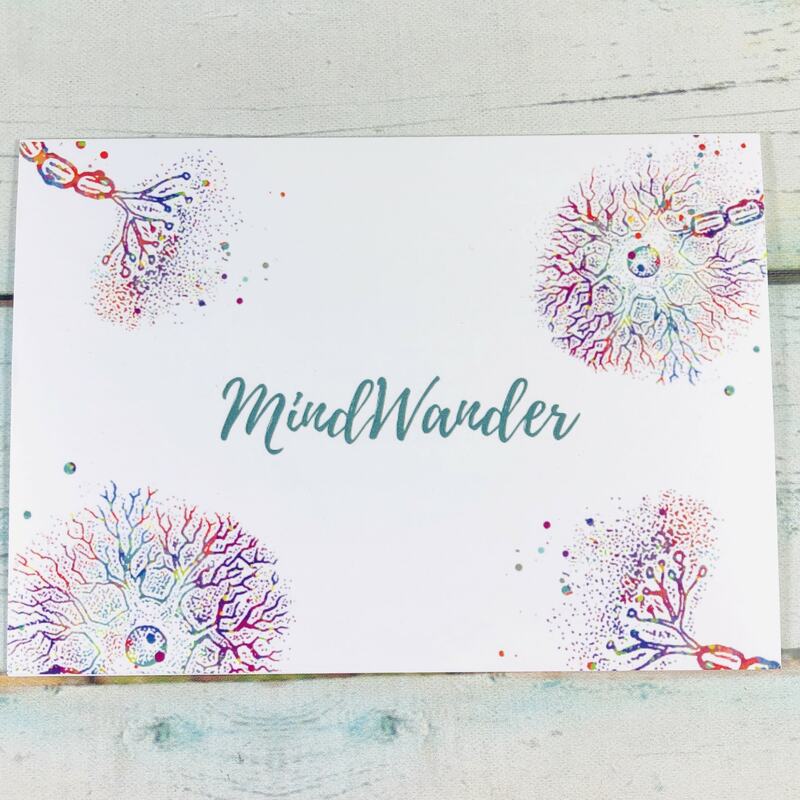 Visit MindWander to subscribe or find out more! 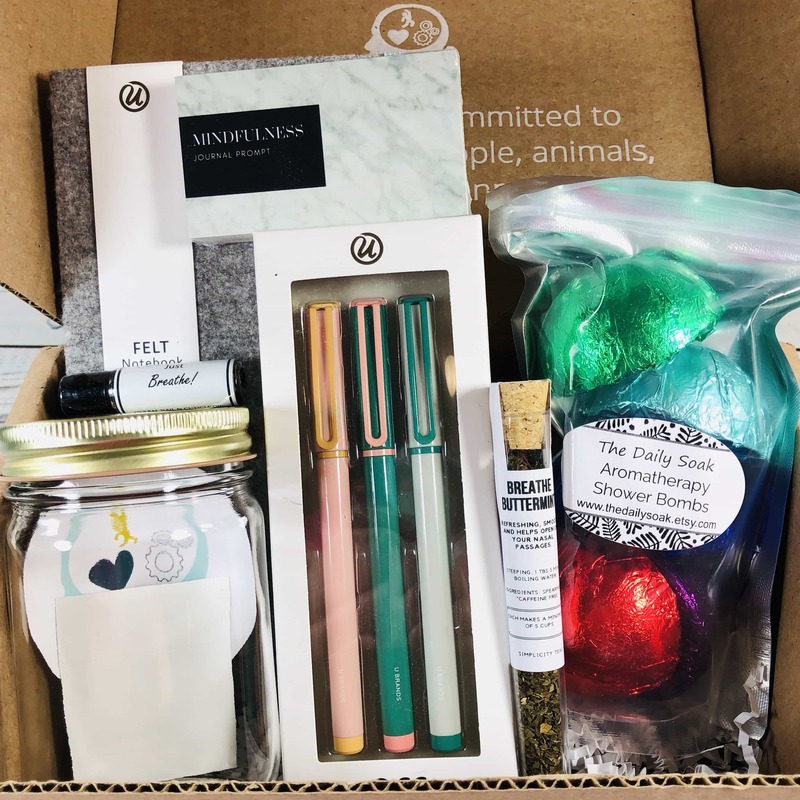 Each self-care box pairs anxiety and stress relief tips with carefully curated lifestyle items. 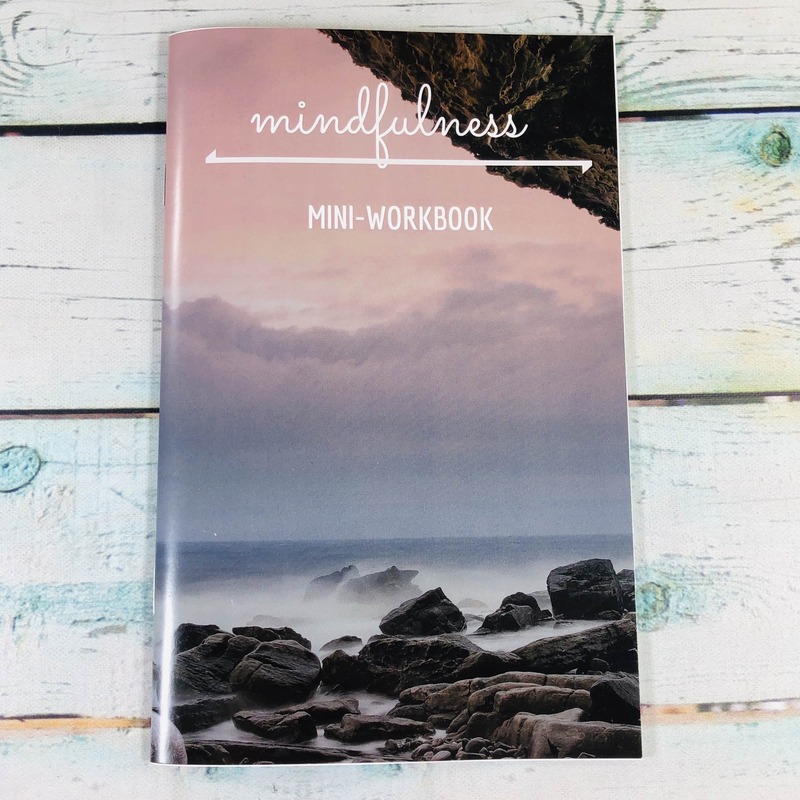 Designed by a clinical psychologist and therapist, boxes include a mini-workbook filled with worksheets, activities, and ideas. Unique themed items make practicing the skills fun and memorable! You deserve to relax, be mindful, and live your best life!